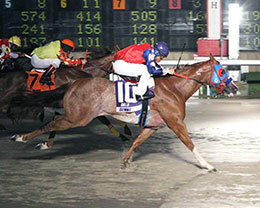 Ms Leaving You, under jockey Luciano Duenez, winning the $35,000 Par A Dice Stakes Thursday night at Delta Downs. VINTON, LA—JULY 5, 2018—Ms Leaving You(30-1) stepped up in stakes competition for the first time her career Thursday night to post an astonishing half-length win over A Canadian Chill in the $35,000 Par A Dice Stakes at Delta Downs. Lil Bro Big Streak finished another half-a-length back to take third. Ms Leaving Your, a 4-year-old daughter of multiple stakes sire Coronas Leaving You, closed fast under jockey Luciano Duenez to complete the 300 yards in :15.125 seconds, a 101 speed index over a sloppy (sealed) race course. Trainer Kenneth Weeks saddled the sorrel filly to her third career win in 10 starts for owner McGehee Horse and Cattle LLC. The $21,000 Par A Dice winners' purse boosted her career earnings mare to $52,632. Grant Farms LLC bred the royally bred filly in Louisiana from the multiple stakes producing Splash Bac mare Ms Pilot Point. 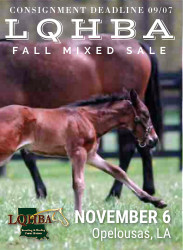 A $55,000 LQHBA Yearling Sale graduate in 2015, Ms Leaving Your is a half-sister to All American Futurity(G1) winner and multiple stakes sire Mr Piloto, Dash For Cash Derby(G3) winner Paint My Pilot and grade 1-placed Point Break Dash. Ms Leaving Your rewarded backers with a whopping $63 to win, $31.40 to place and $13.60 to show. A Canadian Chill paid $11 to place and $5.40 to show and Lil Bro Big Streak returned $4.40 to show. Runner-up A Canadian Chill put in a solid effort under jockey Jorge Linares to earn $7,000 for finishing second. Martin Trejo trains the 3-year-old son of Grade 1 winner Igotyourtac for owner Gerardo Ibarra. Belinda Disotell bred the stakes-placed gelding from the Osceola Warrior mare Osceola Colors. A winner of three races in nine starts, A Canadian Chill has banked nearly $39,000. Trainer Ray Moyo saddled restricted G2-placed Lil Bro Big Streak to his third-place effort for owner Rosendo Valdez. Luis Vivanco had the riding call aboard the Jet Black Patriot gelding out of Annas Streakin Dash by Streakin La Jolla. 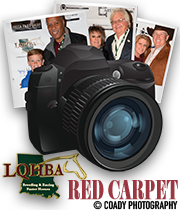 Second in the Louisiana Champions Day Juvenile (RG2) at and the Billy Montgomery LAD Stakes at 3, the 4-year-old picked dup $3,850 to bring his earning mark to $101,330. Bobby Miller is the breeder. Heza Truckin, Game Angels, Dutcher, Sassy Chic 3341, Going Hot, Mps Shake Em N Style and Capital Ice completed the field. Delta Downs will card another 12-race program on Friday night as the closing weekend of activities begin. The featured race on the card will be the $50,000 Miss Polly Classic Stakes (G3). First post time will be at 5:45 pm (CDT).